What does “conservation” entail in practical terms? Milena Ramov of the Croatian Telašćica Nature Park is ready to clear up any doubts we might have about it, talking about her work with a range of stakeholders, including local fishermen, and the striking features and discoveries made in this area. When and how did you get involved with the Telašćica Park? 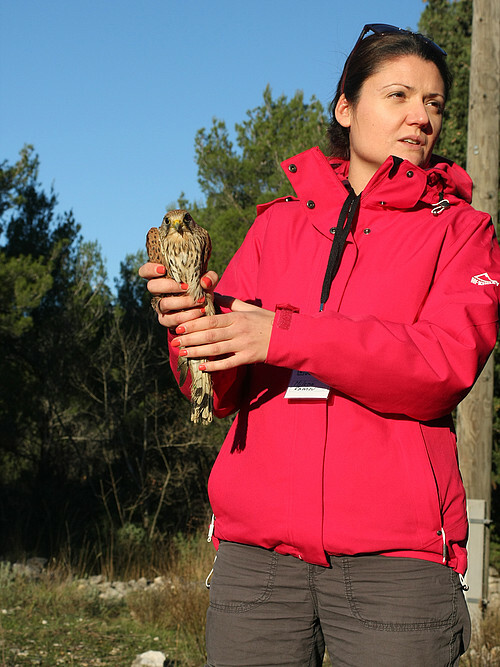 Shortly after I graduated in Biology and Ecology, Telašćica opened the position of expert associate biologist. At first I was supposed to work in Telašćica only for one year but seven years later... I'm still here doing a job that I love! What does the Conservation Services Department deal with and what do you do in detail? “Conservation service” involves managing and protecting the natural resources of the designated marine area (the MPA). Ideally, the job of the conservationist is to conduct research and monitor the indicator species and habitats to prevent negative human impacts on the natural resources and all values of the MPA. In the real world though, it is quite different: Conservation Services actually covers a range of jobs and cooperates with all the services of the Institution. A very flexible department indeed! Throughout the year we deal with the preparation and arrangement of all research and monitoring, as well as activities planned in the MPA. 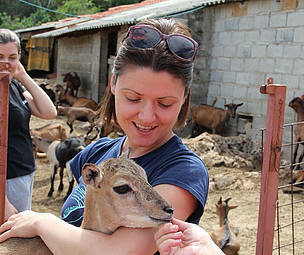 We also cooperate on field work with external experts and scientists, conduct campaigns, environmental education, preparation for the tourist season and tourist guiding, together with the organization and development of all kinds of projects. We cooperate with institutions on developing legislation relevant to the MPA. We even do maintenance of our own IT equipment! Last but not least... we help with the surveillance service (law enforcement) to regulate and prevent illegal activities that may have a negative impact on resources. After all... we are conservation, aren’t we?! Who do you work with and who do you reach out to? Conservation Services works primarily with scientific institutions and experts in implementing the monitoring and research of specific species or habitats in the Park. The results we gather are then used to establish protection mechanisms and improve upon existing ones. The most important form of cooperation is with local stakeholders who own land within the Park. Communication takes place on a daily basis which helps in raising public awareness on the importance of preserving and conserving nature for future generations. This is why today the local community is closely involved in the projects. How is your department's relationship with local fishermen? It might sound like a happy coincidence but the earliest reference to fishery in Croatia comes from Telašćica! Throughout history fishing has been a source of livelihood for many families on the island. Unfortunately though, with the development of new technologies, pressure on fish stocks has dramatically increased — and this is also visible in the park. Constant monitoring of fish stocks showed that there are almost no differences between protected and unprotected areas: they are both in danger. Such alarming data required great efforts in discussions with fishermen. Conservation Services held meetings to inform them and to try and come up with solutions together to preserve fish stocks in the park. After all, on an island with just over 1000 people, daily communication with fishermen is an integral part of life — a tradition. At first it seemed nearly impossible to find a common solution, but after numerous discussions and by involving fishermen in fish stock monitoring, they acknowledged the importance of no-take zones — areas where fishing is not allowed for a certain number of years so that fish can grow and breed undisturbed. Now the implementation and regulation of such zones is about to begin... so we are ready to tackle new goals! Which are the most fascinating and curious features and species of this park? 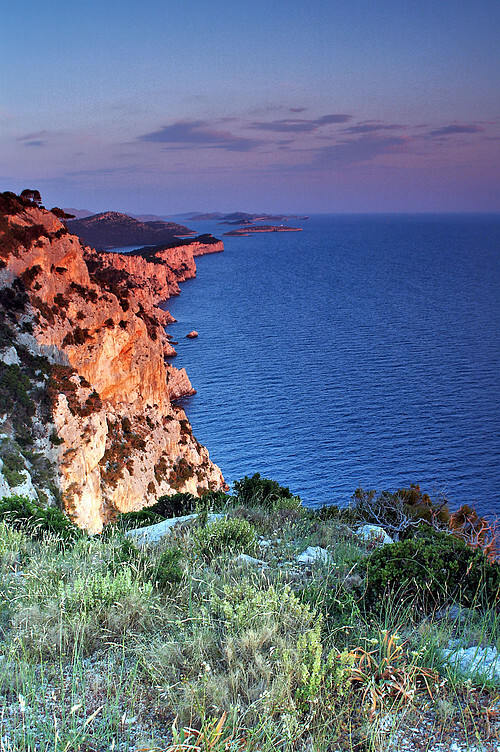 Have you heard about the famous "Stene" of Dugi otok? 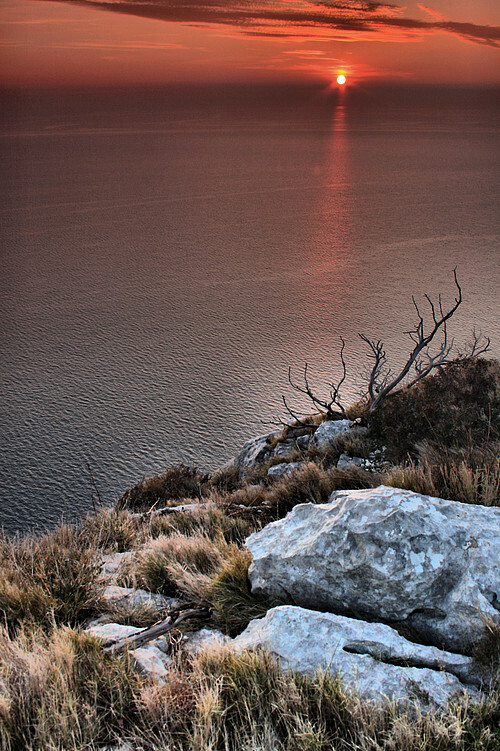 They are vertical cliffs rising on the open-sea side of Telašćica bay: the most spectacular cliffs in the Adriatic! Watching them from a boat, rising 161m in height, you can experience the full power and beauty of nature. Underwater, various corals thrive at the base of the cliffs — including the already rare red coral. Above the sea, the cliffs are a nesting place for the Peregrine Falcon (Falco peregrinus) and Eleonora's Falcon (Falco eleonorae) can also be spotted flying above. Working with injured birds of prey leaves you with an adrenaline rush: you are awe-struck as you witness their strength and dexterity in trying to free themselves from a perceived threat... while you are actually saving them. Now to a great event! Fifteen years ago, in 2000, scientists Bakran and Petricioli made an incredible discovery at the bottom of the cave on the islet of Garmenjak Veli. In a 24m-deep narrow "well", they observed carnivorous sponges of the species Asbestopluma hypogea, which feed on tiny crabs that get tangled in their filaments. This is only the second discovery of this kind... in the whole world! How do architecture, history and tradition combine in this protected area and what do you love most about them? History is still visible in traditional architecture scattered in the fields. Some of those buildings are now renovated and used for tourism. A sense of strong traditional heritage can be seen in crop cultivation, olive oil production, fishing and a respect for nature. There are also amazing dry stone walls which show how much hard work was necessary to create a good quality field in an area of poor soil. Many archaeological sites are marked and labelled with info boards so that both locals and visitors can learn about our country’s past. What I appreciate the most is the balanced coexistence of people and nature. What are the most interesting findings so far thanks to your department’s research? We found one of the largest and rarest species of bat in Europe! Three years ago, a Nyctalus lasiopterus was recorded in Telašćica. That is just the second finding of this kind in Croatia over the last 85 years! During our research we were able to record the bat species Tadarida teniotis with photographs that Croatian scientists had never obtained before. Which noticeable results have you obtained through your department’s conservation efforts? First off, a huge step for the marine park and the people living in the neighbouring area was made during the MedPAN South project (2008-2012): the Institution opened to the local community, inviting their opinions and comments on the Management Plan and thereby creating a solid base for future co-management. Right after, we set up the guidelines for the implementation of the management plan through annual programs. Through the following SeaMed project (2013-2016), an advisory board was established as a communication network with stakeholders. This was an important step in putting into practice the basic principles of sustainable development. 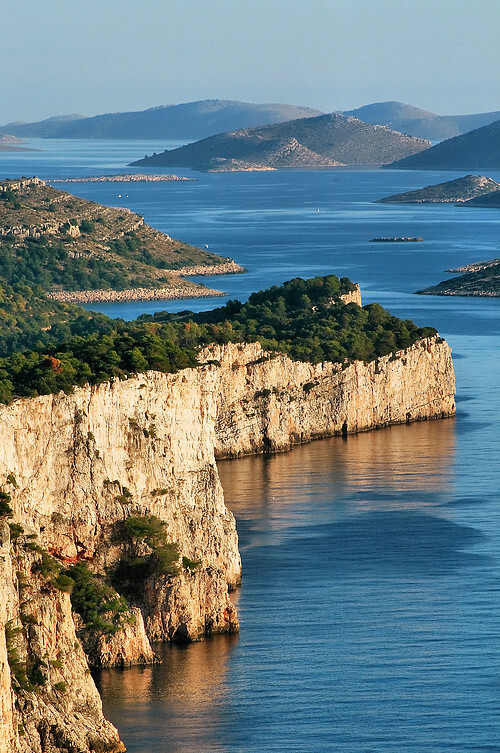 The Institution realized that it made more sense to start planning for sustainable tourism not just within the MPA boundaries but also on the whole island of Telašćica. This approach created a huge role for local communities of the Island, while also helping to maintain the trust gained through the previous planning process (MedPAN South), and educating all important local Institutions on the value of investing in sustainable development of the area. One last result was the regulation of fisheries. Although this negotiation lasted five years, it is close to giving some first results now: the creation of a legal framework according to which the surveillance service will have the authority to regulate fishing activities within the MPA. Which role would you like to cover in the future in this or other Croatian MPAs and why? 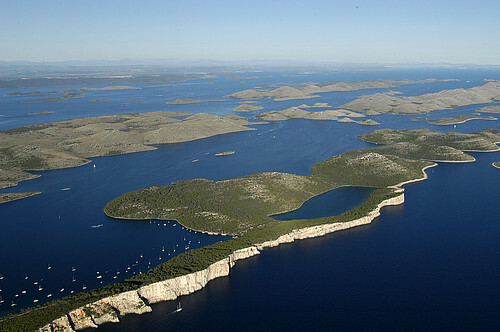 The truth of the matter is that for almost 30 years, as with all protected areas in Croatia, unfortunately, this MPA was a park only on paper: this is why we need time and effort to change this practice and establish a fully functional nature protection system and effective management for the marine park. Being part of a team that is doing projects, research and collecting data that will help the promotion, conservation and protection of this area is something I would love to continue doing.